The Skytap Health Dashboard at https://status.skytap.com displays current status for Skytap, both overall and by region. This page also displays details about each of the regions and a history of past incidents and their resolutions. You can also subscribe to incident alerts that are sent to you in email, text (SMS), or RSS/Atom Feed updates. The top section of the page displays system status for the overall health of Skytap. If there is any disruption to Skytap in any region, the status of the incident is displayed here, including updates about the incident. If an incident occurs, a summary of the incident is displayed. The heading color indicates the severity of the incident. Yellow Service degradation Skytap is available but may not perform as expected. Users are likely to experience minor performance issues with page-load times or storage. Orange Service disruption Skytap is experiencing issues that are likely to affect the ability to use the service. Users are likely to experience partial unavailability of a system or service. Red Service unavailable Skytap is experiencing a significant service disruption. Users are likely to experience significant unavailability of a system or service. Blue Maintenance in progress Skytap is temporarily unavailable for scheduled maintenance. The effects vary depending on the type and scale of maintenance. Click a region to see details about the status of each region. Website displays status for the Skytap portal and corporate sites. The Past Incidents section displays a history of incidents and their resolutions within the last 30 days. Click an incident heading to see the full report of the incident. Click Incident History to view incidents older than 30 days. In addition to the real-time information available at https://status.skytap.com. Skytap can automatically send incident status updates to you. You can choose any combination of email, text, or RSS/Atom feed updates. 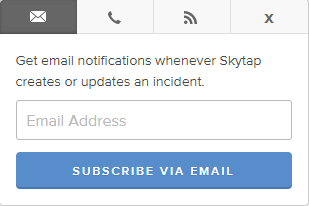 When you subscribe to email status updates, Skytap sends an email whenever an incident is created or updated. Provide a valid email address, and then click Subscribe via email. The Notifications Subscription page displays. Choose the regions and which details to include in notification emails. Move your mouse over a region name to display a link to select or deselect all of the details for a region. Click Cancel Subscription to end email notifications. 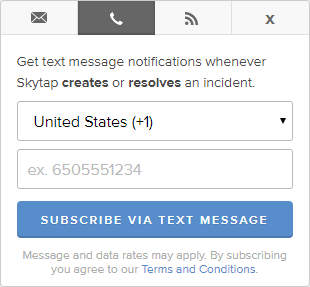 You can have status updates sent as text messages to your mobile phone whenever Skytap creates or resolves an incident. Choose Provide a valid mobile number, and then click Subscribe via text message to receive text message updates. You can view status updates as an RSS or Atom feed.